In the midst of the third coldest winter on record in Vermont, it only seemed appropriate to head down to Waterbury and stand outside on what promised to be one of the more beautiful days anyone could remember… and Vermont didn’t disappoint. Arriving at the train station around 8:30am, we were greeted by about 40-50 people who had gotten there before us. Many of the earliest arrivers seemed to be from out of state, mostly from New York and the New England area. As the Alchemist trucks began coming in, a makeshift line began to form just as the sun made it’s first appearance in what felt like a year. I heard a grumbling or two about friends cutting in line, but those seemed dismissed by most as just another angry beer nerd getting his rage on. You all know the type. After an hour or so, The Alchemist staff escorted the group – now numbering around 250, or so – to the staging area, in a line leading up to a few popup tents containing merchandise and, you guessed it, beer. A DJ was starting to pump out some familiar soul and reggae hits, with some intermittent Phish tunes (it’s Vermont, you have to), while Jen Kimmich gave out raffle prizes to some local restaurants and bars. If you’ve been to Waterbury, you know the ones I’m talking about. 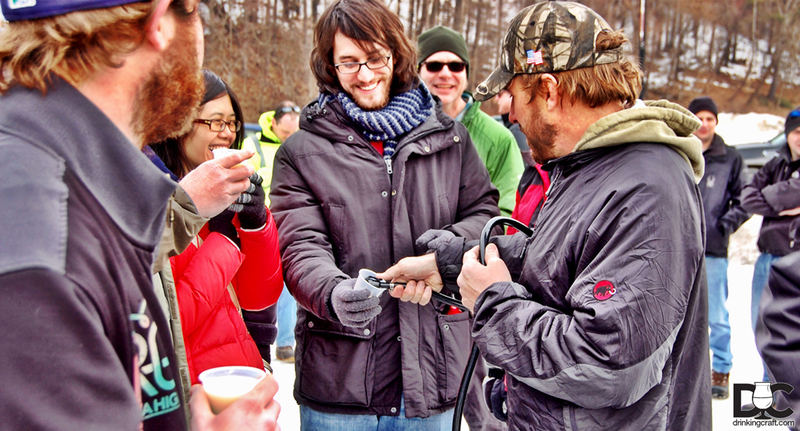 Meanwhile, John was walking around with a wagon and keg, passing out samples of Heady Topper throughout the crowd. Free coffee was provided, as well as some sort of bacon something or another. I only say this because I could smell it, but never saw it. One of my favorite parts of the day, is when the staff passed out what they called “The Douchebag of the Month” ballots. These contained three of their favorite scathing reviews, idiotic questions, or rants from angry beer geeks who couldn’t get their beer. People could then vote for their favorite DB of the Month and hand the ballot in for prizes. Now for the beer! Around 10am, the line started moving up to the beer tent. 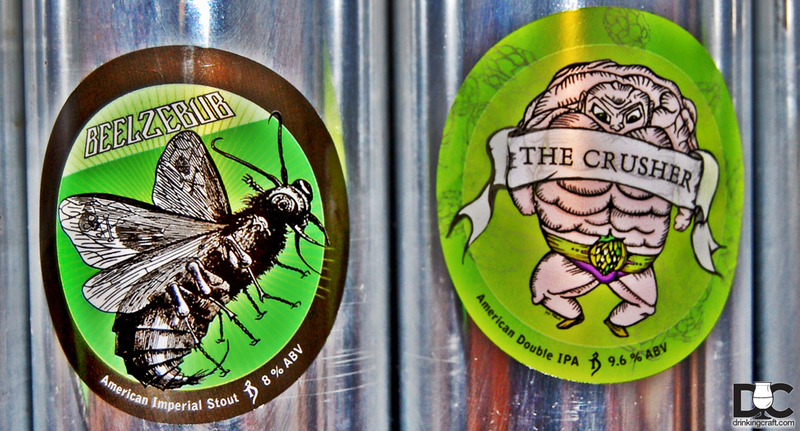 Cash only, $80 got you a mixed case of The Crusher, a 9.6% Imperial DIPA and Beelzebub, an 8% Imperial Stout, both in that wonderful silver Alchemist can we have all grown to love. Heady Topper was also available for $75/case, with a limit of one per person. All of the beers listed were available in four packs as well as single can purchases. The line moved extremely quickly with the Alchemist staff expertly running the show. Being a cash only situation really made for a quick and easy transaction, and The Alchemist had more than enough staff on hand to keep everything running smoothly. Within 25 minutes, the 50 or so people in front of us were gone, I had my beer, and I was walking to the car. 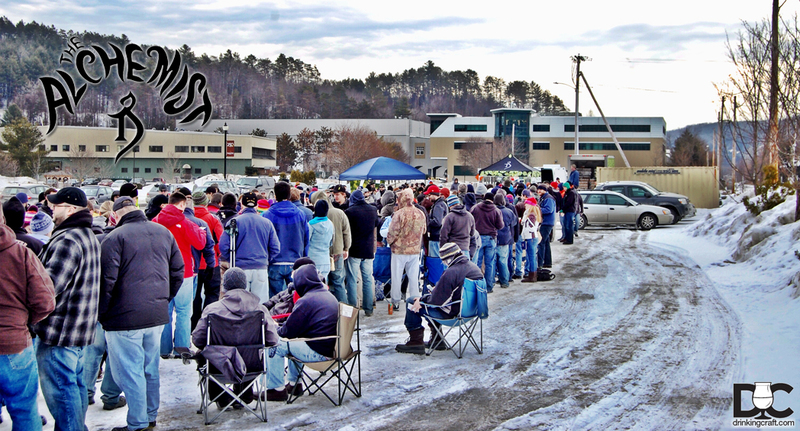 Overall, this was arguably the easiest and most organized beer release I can remember. I understand that some people may not have gotten their beer, but I cannot see that being the fault of The Alchemist or the people buying in line. While there were, of course, some mules in line for people, I noticed alot of people only walking away with a four pack or two. The Alchemist’s request about leaving some for the “out of towners” seemed to resonate well with the “locals”. All in all, the entire process took me almost exactly 3.5 hours, with 2 hours of that being line time. Not too shabby at all. I hope the rest of you had the same pleasant experience that I did and are eager to attend the next truck release! 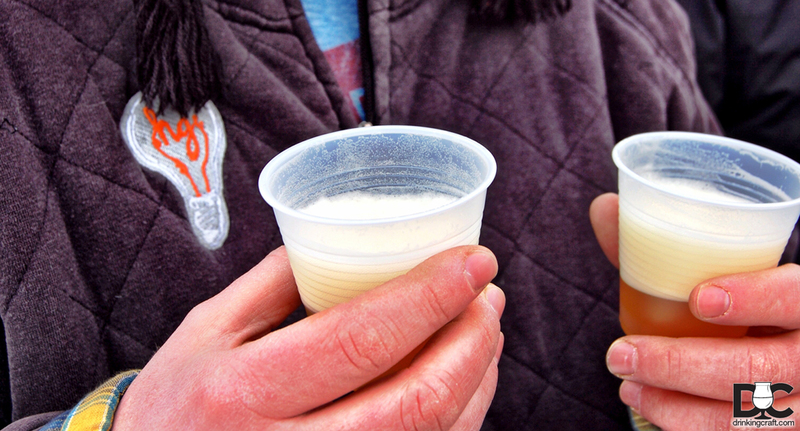 Remember, it’s only beer – Be polite, be understanding, and most of all, have fun. Just a beer lover living in the Green Mountains of Vermont.